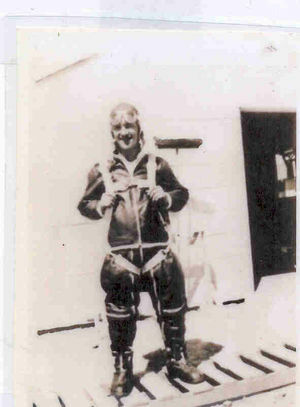 [[image:Gene_Estle.jpg|thumb|Gene Estle in his flight suit before mission]]One major difficulty that the bomber crews faced while on the raids was the low temperature that one has to endure once up that high. 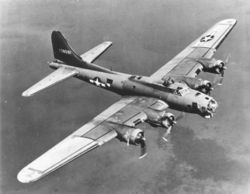 The bombers would fly at normal altitudes of more than 20,000 feet and temperatures could reach down to -60 degrees Fahrenheit at that altitude. “Boy it was so cold up there that your snot could freeze inside your nose if you wasn’t careful”, Eslte stated (Personal Interview). At those temperatures if any skin was exposed for too long the skin could be frostbitten. To keep frostbite from occurring the crews equipped themselves with as many layers as they possibly could (See Appendix IV). They tried to cover every inch of their bodies, and underneath it all, they were given an F-3 flying suit that was electrically heated using small metal wires that ran like veins throughout the suit (Childers 77). This invention helped, but the rides were still very uncomfortable for the crews that manned these “Flying Fortresses”. [[image:Powindefication.jpg|thumb|Gene's P.O.W. Identification form]]Aside from the interrogation and the solitary, the P.O.W. confinement for Gene was not so bad. “I was outa combat, it wasn’t too pleasant, but there were a lot of us there so we got through it,” Gene stated (Grider Interview). Gene is predominantly Catholic and still to this day worships at St. Paul Catholic Church. He stated in a personal interview with me that each week a group of Catholic prisoners would get together to pray and have their own little mass in the camp (Personal Interview). Also, during Christmas Eve of 1944, the guards allowed the prisoners to walk about freely and talk and celebrate for the evening (Grider Interview). The prisoners learned to communicate with the guards well and there were a couple one or two that became friendly with the prisoners, but for the most part the Germans stuck to themselves. The prisoners would nominate their own group leader that would negotiate with the German guards their wants and/or needs that the group had. On some occasions they would bribe a guard with cigarettes for wartime news and extra rations (Personal Interview). 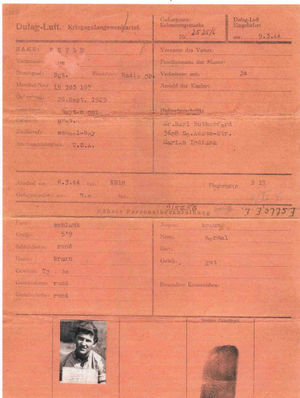 Also, the Germans let form letters be sent out with censorship with the Red Cross to and from home to let families know their sons were alright. After awhile in the camp with nothing to do but exercise, the YMCA furnished basketball equipment for the prisoners and the Germans allowed the men to use the equipment to play with (Grider Interview). The prisoners would form their own teams, and Estle recalls two of his fellow prisoners on his team. The first, Cliff Barker, went on to join the Indiana Olympians after the war. Another name Gene remembers was an Ogie Donatelli. After the war Ogie went onto become an ump for the MLB (Personal Interview). After being moved around Germany a few times to evade the advancing Russian Army, they finally were moved to Barth, Germany and were finally liberated on May 1, 1945 a week before V - E Day (See Appendix XIV) (Grider Interview).